This hand-held medical device applies computer modulated, therapeutic, electro stimulation through the skin in order to balance cellular activity. 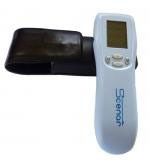 When pain or inflammation is present, the Scenar stimulates the natural production of neuro peptides, which act to restore the body to homeostasis (biochemical balance). More advanced versions are available for medical practices, as well as two units for sports and personal use.